Compass & Protractor Set 6"
Compass & Protractor Set 6" - ACME-Compass & Protractor Set. 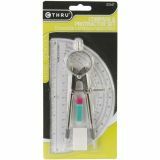 This is a handy set of tools to have for a math class, art class or a variety of projects. This package contains one 6 inch semicircular protractor, one 6 inch compass, an eraser and spare leads. Imported.